The GV-Center V2 Pro is a professional version of Central Monitoring Station (CMS) software that can.. The GV-Dispatch Server is a computer with Dispatch software that works with GV-Center V2 servers and.. 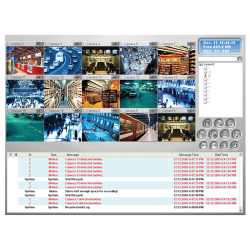 The GV-Control Center is integrated security management software that provides a handy tool to maint.. The GV-Vital Sign Monitor is event-alert text messages service recommended for a large cluster of ne..